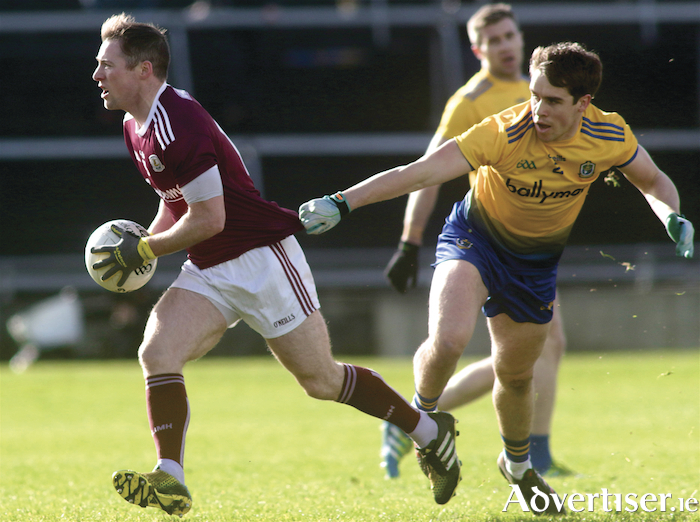 One point was all that was needed to confirm division one status for Galway footballers for 2020 but the home side set their sights on a bigger prize at Pearse Stadium on Saturday. The final scoreline of 1-17 to 1-10 ensured Galway not only achieved their first priority of playing division one football next season, they also put pressure on both Mayo and Dublin in the race for a league final spot. With Dublin losing to Tyrone, Galway now know that a win in Omagh on Sunday could see them reach their second league final in a row. With the prospect of playing Tyrone away from home in their final league game, Kevin Walsh will have been delighted to see his side ease to victory against a physically strong Roscommon side. Confident goalkeeping from Lavelle, along with a dominant and powerful defence, made the game much easier for Galway further up the field. This, allied with Ciaran Duggan and Tom Flynn winning their battle in midfield, allowed the Galway forwards to showcase their talents. Galway controlled the game from start to finish, and they could easily have won this game by double scores but for five missed shots in a row towards the end of the wind-assisted first half. Shane Walsh, Antaine O’Laoi and the hugely impressive Danny Cummins contributed 1-10. Michael Daly played further out the field and managed to get on an abundance of breaking ball to start the attack. Galway pushed up hard on the Roscommon kickout, giving Lavelle a marking job in the full back line to allow for an extra man out the field. Walsh’s main concern will be that poor shooting. With several chances squandered through a combination of inaccuracy and decision making, Galway were in danger of not taking advantage of playing with the elements. However a well-worked move in the second quarter ended with Cummins scooping the ball into the net, and the goal was quickly followed by two more scores to put Galway seven ahead at the interval. Thus, after a somewhat shaky start to the league with a narrow win over Cavan and a disappointing day against Dublin, Galway have really pushed on and grown as the league has progressed. With all new players contributing, Galway have won three of the four games since that Dublin match and were unlucky to concede late on when losing to Kerry. The Dublin game aside, results show that Galway are becoming a force. With several players still to return from injury, allied to the successful Corofin contingent, this team has the potential to get stronger as the season progresses. Galway: R Lavelle (Salthill Knocknacarra ), E Kerin (Annaghdown ) S Ó Cellaigh (Naomh Anna ), DWynne (Moycullen ), G O’Donnell (Tuam Stars ), J Daly (Mountbellew/Moylough ) G Bradshaw (Moycullen ), T Flynn (Athenry ) C Duggan (Annaghdown ), P Cooke (Moycullen ), S Walsh (Kilkerrin Clonberne ), J Heaney (Killanin ), D Cummins (Claregalway ), M Daly (Mountbellew/Moylough ), A Ó Laoí (Án Spidéal ). Substitutes: S Kelly (Moycullen ) for O’Donnell (58 ), FO’Laoi (Án Spidéal ) for Cummins (68 ), P Cunningham (Headford ) for Walsh (70 ), C D’Arcy (Caherlistrane ) for Flynn (72 ).